A beanie hat is not just that an essential hat that you would wear in the winter to keep your head warm. It is not also the hat to cover your bad hair. 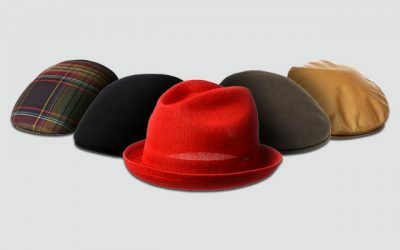 In fact, the best beanie hats for men will do all of that, and also, make you look neat and stylish. 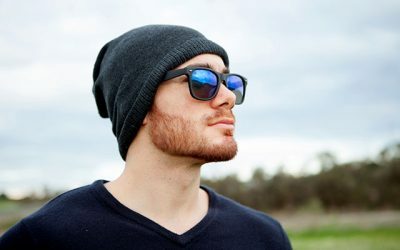 When you look for a beanie hat to add to your wardrobe, there are many things that you need to consider including the materials- such as wool and acrylic, sizes, and colors. 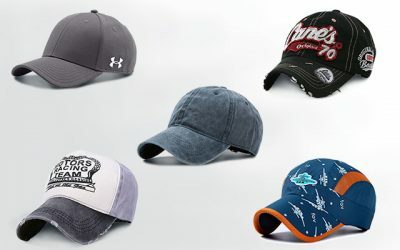 You can check out these most famous men’s brands here as well for they offer some of the high-quality beanie hat on the market. Also, you can scroll down for the review below for the best beanie hats you can buy on the market at the moment. This beanie hat is made of 60% of acrylic & 40 % of polyester. The blended material is soft and smooth on the touch. And while it features the fleece lined fabric to help retain the heat for the coldest day, this beanie hat is also breathable for you to wear the hat all day long. There are 7 colors for you to choose from- from black to blue and spicy mustard. Maybe the quality of the beanie hat is not the only thing that a man would pay attention in this hat. In fact, this beanie hat is one of the rare beanies for guys with advanced built-in technology. And if you are the one who cannot live without technologies and gadgets, this is the thing that you shouldn’t miss. 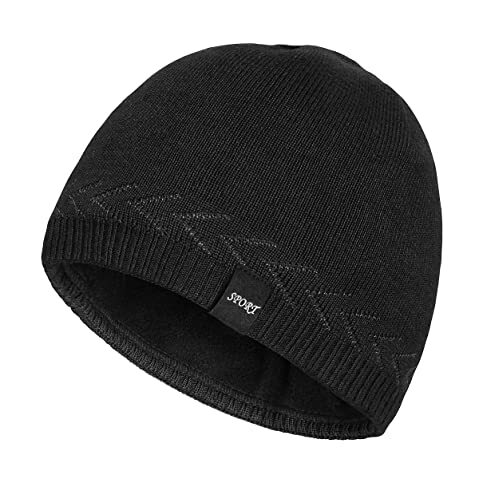 This beanie hat has the built-in Bluetooth headset using the V4.2 technology. With this headset, you can easily pair to your Smartphone or tablet device. Basically, you can have hand free calling or a portable music hat. Not to mention that the wireless range is up to 33 feet so that it can easily use your phone while you are busy doing something such as running or snowboarding. The technology of this hat is not just for display. It is easy to use with 3-prompt buttons and LED indicator light. The battery can run for 6 hours with the charging time of f 2.5 hours. It is also of high quality that it will last for a long time. And you can still wash the hat after you remove the Bluetooth headset. With its amazing features, this hat can be worn when you go to school or when you take part in outdoor sports. I am sure this hat will be your essential everyday hat. 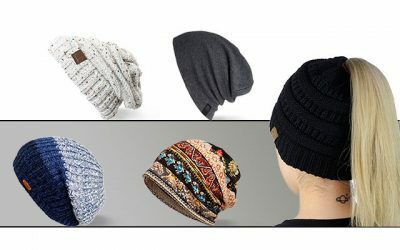 This article about fashion tips of wearing beanie hats (https://thebesthat.com/7-fashion-tips-on-how-to-wear-a-beanie/) can be beneficial for you if want to learn how to wear the hat properly and in a fashionable way. This beanie is made of 100 % of acrylic featuring the long cuffed style with no logo sown on the hat. You can choose from many colors such as green, blue, white, or black with this hat. In fact, you have more than 25 options of colors to choose from. Whatever color you like, you probably find your favorite with this hat. With the simple design and the solid color, you can wear this beanie hat with your casual or smart clothes. Thanks to the high quality material, this hat is super comfortable. You can easily find a good fit with this hat. In fact, it can be stretched of up to 60 centimeters to fit your head comfortable. The material is thick enough to keep your warm in the mild cold days. It is also very breathable and lightweight. 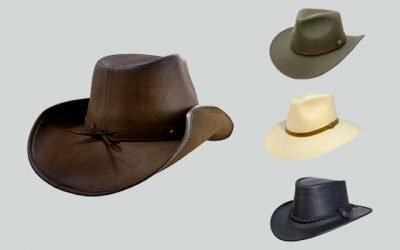 While the hat is stretchy, it can retain the quality of the fabric and the original shape well after it is worn for a long time. You can also wash this hat both by hand or with the washing machine and the quality of the fabric will not deteriorate at all. It is not thick enough to keep your warm in the severely cold winter days. This is one of the cool beanies that you can enjoy wearing in the fall days as well. Are you looking for a beanie hat which is made of the most premium wool in the world? Check out his beanie hat which is made of 10 % of Australian Merino wool, the material which is the softest and smoothest option you can have for a winter hat. 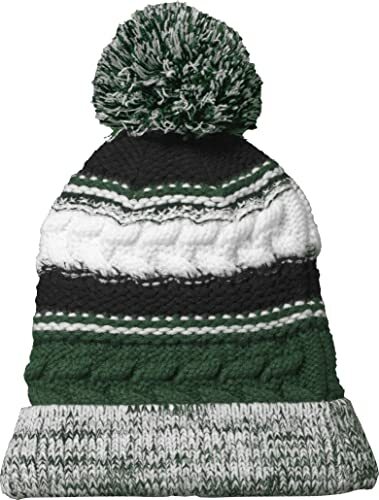 Other materials of this beanie hat include 20 % of acrylic, 20 % of nylon, and 50 % of polyester. This men’s knit beanie is available in solid dark colors including black, grey, and dark navy. It features a plain and stylish design with the logo of LETHMIK..
With the premium material, this beanie hat is comfortable to wear with the needed warmth and elasticity that you would need in a cold winter day. 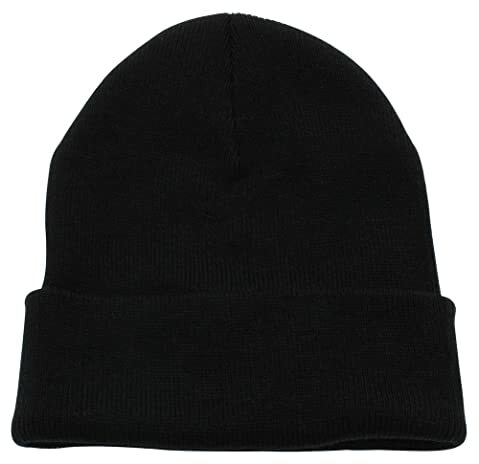 It is one of the stretchy beanie hats on the market that can help fit most of the head’s sizes. While the Merino is the most premium wool, it is also a sensitive material. Hence, you should avoid machine washing this hat or brush washing it to prevent pilling. This hat is long enough for you to wear over ears to help protect them from the cold weather. 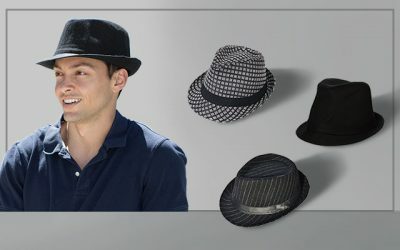 Also, you can easily fold the hat up to create a more refreshing style. If you want a slouchy look, just pull the cuff back down. Looking for slouchy beanie hat? With simple unisex design? In both bright and dark colors? If you say yes to all of the three questions, this hat is the one that you should consider. 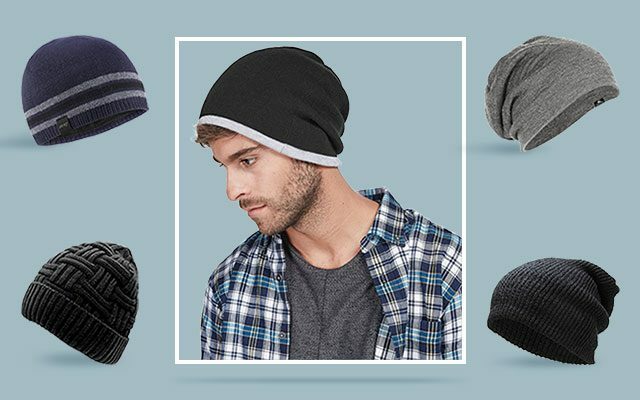 With more than 40 choices of colors and patterns for you to choose from, there is no more beanie for men that can offer you more choices of colors. For me, this beanie hat is one of the lightest beanie hats that you can find on the market. It only weighs about 3 ounces, making it comfortable for you to wear the hat for a long time. With the fabric made from 100 % of acrylic material, this beanie hat is capable of providing warmth and comfort for you in a cold day. It is not too hot but not too cold so you should wear it when it is mild cold. 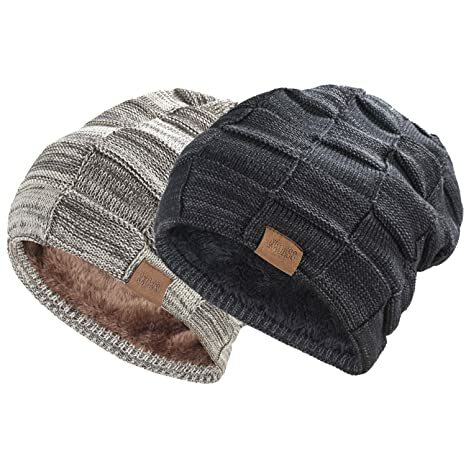 In addition, this beanie hat is made with an excellent craftsmanship so that there is no loose thread on the hat. The construction of this hat is also very sturdy and solid as well as being foldable and packable for easy storage. You can wear this beanie hat when you go outside, taking part in activities such as camping and hiking. It also looks good on your casual daily wear. Not to mention that you can wear this beanie hat straight for a more slouchy sluggish look or you can fold it for a short skully looking style. Another slouchy hat of premium quality is the one from REDESS. It is made of acrylic material with acrylic lined fabric. This beanie hat is available in 3 options of colors, which are black, brown, and wine red. It also features the fashionable knitting pattern to make sure you can have an instant trendy look when you wear the hat on. This hat is one of the beanies for men that are warm enough for you in a cold day thanks to the high quality materials. In fact, it offers you a double protection with two layers of materials. The outside layer is the knitting yarn while the inner layer is made from wool. These materials are able to retain heat and keep your head warm in the coldest days of the winter. While the materials seem to be thick, it is comfortable to wear the hat thanks to the rubber band. This rubber band is built inside the hat which is adjustable to hug your head perfectly. It also prevents the wool material from rubbing your forehead effectively. Also, the beanie hat, while being heavier than the acrylic beanie hats, is still quite lightweight and will not cause pressure on your head. You can wear this hat in your everyday wear. 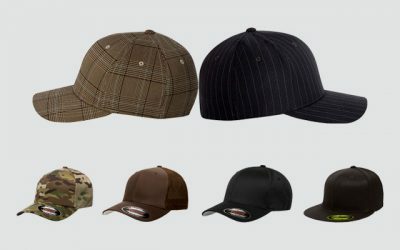 Also, thanks to its solid and dark neutral colors, you can wear this hat with your smart clothes as well. 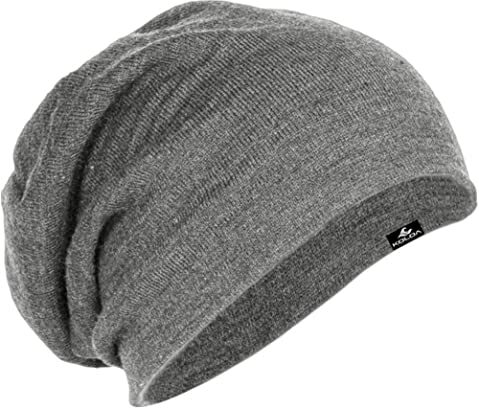 If you are looking for a men’s slouchy beanie to wear in the fall and early winter, check out this lightweight beanie. It is made of 55 % of acrylic and 45 % of poly material. It is available in 1 size that offers you a stretchy and comfortable fit. While this hat is available in 1 size, you can choose a lot of colors- from charcoal heather, light grey, navy dip dye, neon blue and yellow. These colors are so bright and vivid that will surely brighten your day. The blended material is comfortable for you to wear. It is not too thin but not winter thick and hence, it has the breathability that you would need in a hat for the warmer days. In addition, with the high quality elements, the fabric is stretchy to bring you a comfort fit. But it will return to its original shape quite quickly, even after a few months of frequent uses. 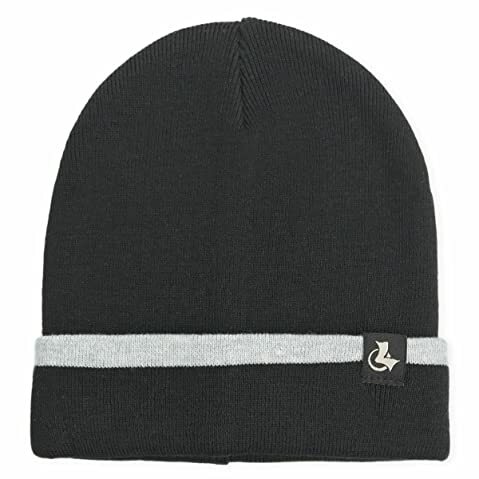 The logo of this beanie hat is printed on the inside of the hat so you can choose to wear the hat with the logo or not. If you want to show the logo, just fold the hat up. The style of this hat is unisex with a classic and traditional look. It would be also easy for you to pair the hat with most of the clothes in your wardrobe. Are you tired of solid and plain looking beanie hats? Are you looking for a younger and bolder looking beanie hats? If this is your case, why don’t we take a look at this super cool looking beanie hat? There are more than 40 choices of unique patterns for you to choose from. While this hat looks nothing like the hat that you would find in other beanie hats on the market, it has the features that you would find in a beanie hat worth buying. This hat is made of 100 % of polyester providing you a feel of coziness and warmth. In addition, it is thin and lightweight; stretchy as well to give you a good and comfortable fit on the head. It can fit head’s size of more than 23 inches. Among all materials which are used to make beanie hats including acrylic, wool, and polyester, polyester is the easiest material to care for. 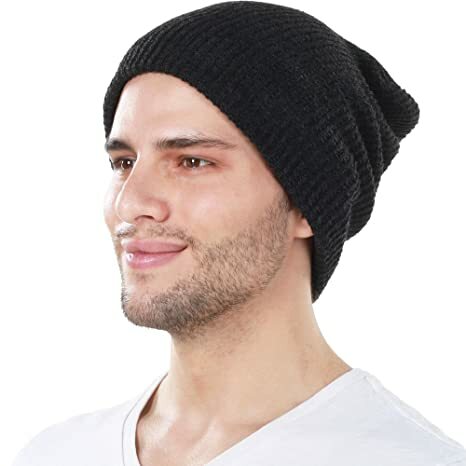 With this polyester beanie hat, you can easily wash it with the washing machine or by hand. It also has a quick drying performance. Also, when ceases appear on the hat, you can easily iron the hat to make it flat again. You can as well pack it in your bag and bring it along with you when you go travelling. It is the perfect companion for the mild cold weather. You can wear it in the summer’s nights as well. With its unique and bold patterns, it would be hard to pair it with other pieces of your clothes. Still, if you do it right, you would have one of the most outstanding looks on the street. When you take in outdoor activities or drive a car, possibly under the board day light, you would need a hat that can prevent glaring. In this case, you would need a hat with visor. Here is the one that has visor which is also stylish and high quality. This beanie hat is available in black or grey color. The materials of this hat include 70 % of acrylic and 30 % of wool. It is available in 1 size which fits the head’s circumference from 20 to 25 inches. 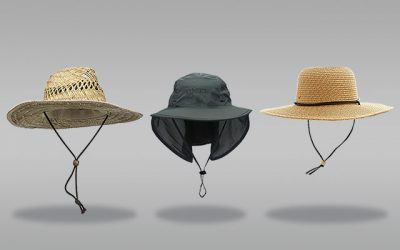 Besides the functional visor which helps to offer coverage for your face and protect your eyes from glazes, the hat also feature a good looking design with the cable knit element. Also, the visor is curved in an appropriate way so that it will not block your sight but is also capable of protecting them. The visor is made nicely and carefully for a firm and solid construction. While it is firm and solid, you can slightly bend the curve of the visor to the degree that you feel most comfortable with. The wool material makes the hat thick and warm. The inner side of the beanie hat is attached with a furry lined fabric. It is cozy and warm as well as capable of retaining heat well. Also, your forehead will not feel irritated at all. This beanie hat is made of 100 % of soft spun acrylic fiber. 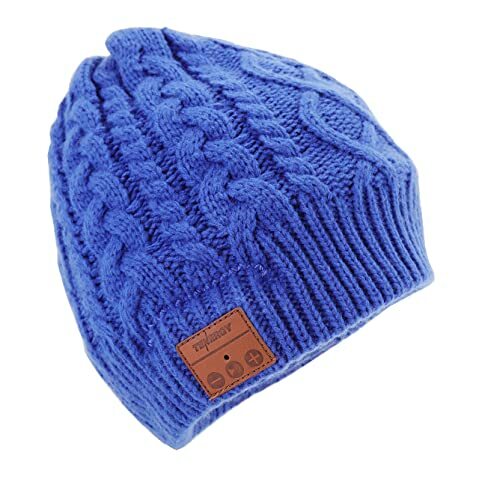 It features the style of a traditional and classic winter knitted beanie. The acrylic material is soft and lightweight. 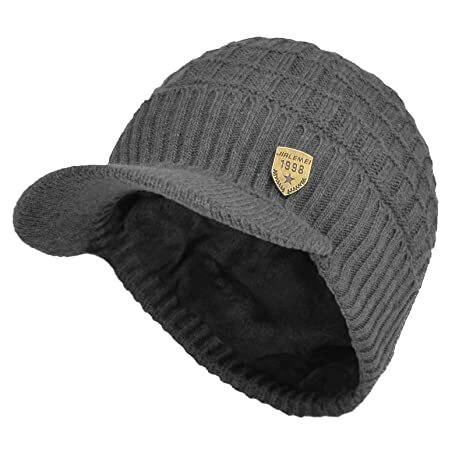 In addition, the beanie hat is made with artificial wool inner liner. This liner provides extra warmth for the hat. Also, it is fleece lined to prevent the wool material from rubbing your forehead and making it uncomfortable. Overall, it is one of the softest and coziest beanie hats on the market with a hand-knitted feel. It is warm enough for the cold winter days and you can wear this hat when you take part in outdoor activities in those cold days. It can retain the heat effectively while keeping you feel comfortable and well-ventilated with this hat. Here comes another beanie hat for the autumn days. This hat is made of 100 % of soft acrylic. The material makes the hat lightweight and comfortable to wear. 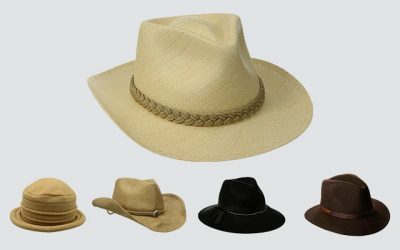 It is not too hot and breathable, a perfect feature of a hat for you to wear when it is not too cold outside. In addition, the acrylic is stretchy so that it can fit your head nicely and comfortably. The size of this beanie hat is large enough for you to wear the hat over the ears, helping you to protect them in the cold weather. While the hat is made of acrylic it is not thin at all. In fact, it is quite thick and capable of retaining heat effectively. It is also very lightweight that you would not feel any burden, especially when you have to wear the hat for a long time. It is foldable into a small and compact piece for you to store in your bag, making it convenient for you to bring the hat along with you when you go travelling. It is also among the beanie hats that you can wash with the washing machine. This beanie hat is an ideal headwear for daily wearing as well as when you take part in indoors and outdoors activities. 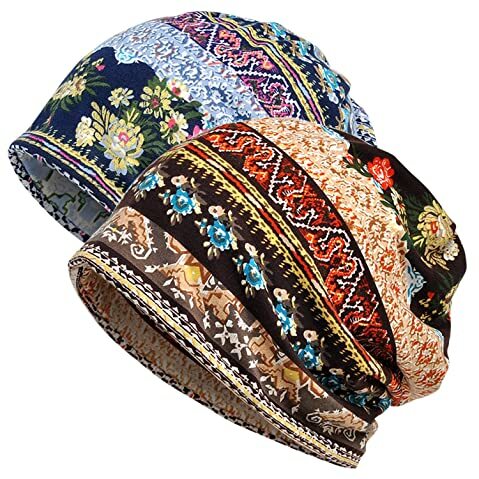 The main problem that someone might have with this beanie hat is that it is available in 1 pattern so that you don’t have much choice in options of colors. Mens pom beanies might not be the most popular style of beanie hat that a man wants. Still, when you wear the beanie in the right way, it would make you look unique, outstanding, and fashionable. While the hat is not suitable for a smart outlook, it can enhance your smart outlook or a casual outlook for a cold night out. This beanie hat is made of 100 % of acrylic. It features the chunky-knit style that is capable of keeping you warm in the winter day. The material, like the materials that you could find in other high quality beanie hats on the market, is of premium quality. It is soft and smooth on the touch. It is also tough and durable. 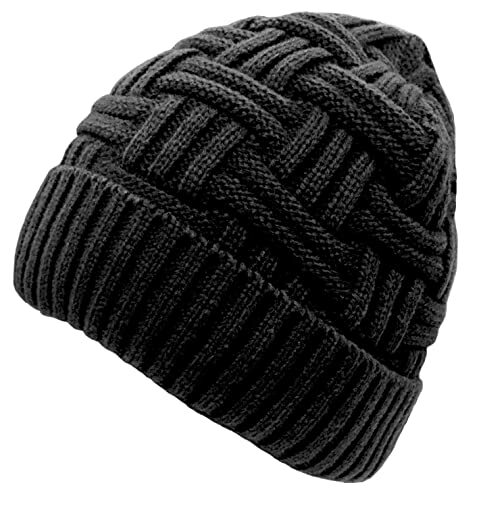 Furthermore, this beanie hat is made with an excellent craftsmanship for a solid construction. In addition, the pom pom on the hat is stitched nicely so that it will not easily fall down, regardless of how frequent you wear the hat. The pom pom detail on the hat makes it heavier than other beanie hat but it can worth if you want something more unique than usual. And when you decide that you would no longer need a beanie hat with pom pom, you can easily cut it off the hat and you will instantly have a new beanie hat with a new look. That is all about the hottest and most popular beanie hats for men that you can find on the market in 2018. As you can see, not all of the beanie hats are made in the same way with the same material or design. Think about your needs and requirements. Do you need a hat for the mild cold days of autumn or the severely cold days of winter? 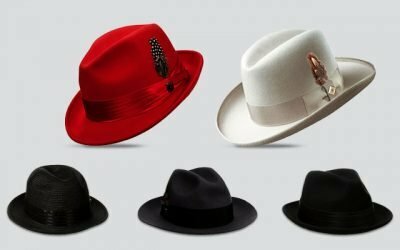 Do you need a formal looking beanie hat or a cool and unique beanie hat? 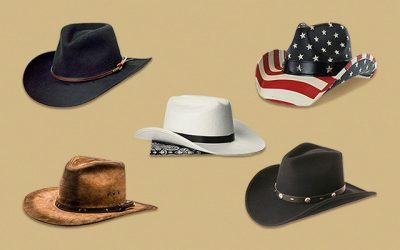 How much you can afford for a hat? Do you need anything special in a beanie hat such as a Bluetooth headset? 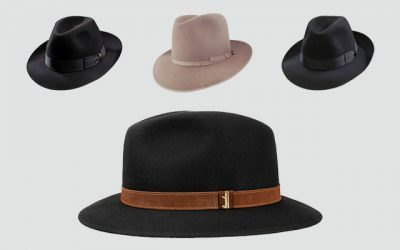 You need to know the answers for these questions in order to find the most suitable hat. And I hope that with all of my recommendations above, you can find the one that you like and buy it to add to your hat collection for the upcoming autumn and winter season.